obsessed with knitting: maggie, it worked! It is made from RYC Cashsoft DK in cream and Rowan Felted Tweed in dark grey on a #5 U.S. needle at 6 stitches and 8 rows per inch. The Cashsoft is a thicker DK than the Felted Tweed, so its ribbed gauge exactly matched the stockinette gauge of the Felted Tweed. That was convenient. I had never used either of these yarns before. 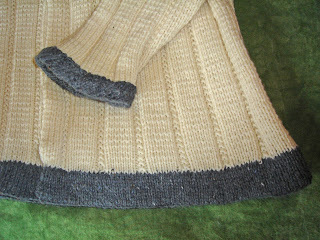 I especially like the Felted Tweed, but even though it has 190 yards to a ball, it doesn't go very far. 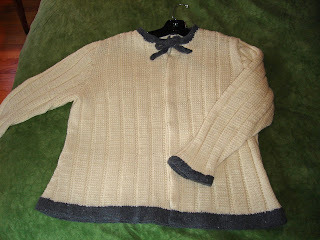 I used an entire ball for the trim on this 40" (chest measurement) sweater. I have had the idea for this sweater in my mind for a long time. Of course it didn't come out exactly how I imagined it. For one thing, I pictured a boxier shape, but I thought a little waist and hip shaping would be more flattering. And the neck is queer. I pictured a tie at the neck, but the neck shaping is off and I didn't have enough yarn to make a longer tie. The worst problem is the button band. I opted out of button holes because buttons tend to distort the line of the opening. I put in snaps instead. But the line is still distorted. I don't know if this is a design flaw, a yarn flaw or what. I might sew up the opening altogether and make it a pullover, especially since it fits better without another layer underneath. The big news about this sweater though, is the knit in, TOP DOWN SLEEVE. It is never easy to fit a sleeve into an armscye without calculus, or is it analytic geometry? In either case, it is over my head. So by consulting my all time favorite book, Sweater Design in Plain English by the divine Maggie Righetti, I found a perfect formula for calculating a sleeve with a short row cap that is made by picking up stitches from the armscye. (An armscye, by the way is very easy to calculate.) This sleeve can be any width you want it to be and it fits perfectly. Guess what, Maggie? It worked! Just like Holden Caulfield in Catcher in the Rye I wanted to call her up and talk to her, but, sadly, I think she died in 2006. This reminds me of another book I recently acquired, Custom Knits by Wendy Bernard, subtitled Unleash Your Inner Designer... Wendy also gives directions for knit in, top down sleeves, knit in the round (pp. 150 -151). She calls them afterthought sleeves. I am more used to Maggie Righetti by now, but this is a very good book with outstanding designs and packed with design techniques. Thanks to Anne for her pleasant and entertaining contribution to this blog. Keep posting honey. Very elegant cardigan. I like the idea of snaps instead of buttons, especially since buttonholes are such a pain to make. I've seen some people sew buttons to the outside, when using snaps,for a sort of faux-buttoned look. That sweater is really cute. I want to try it on.